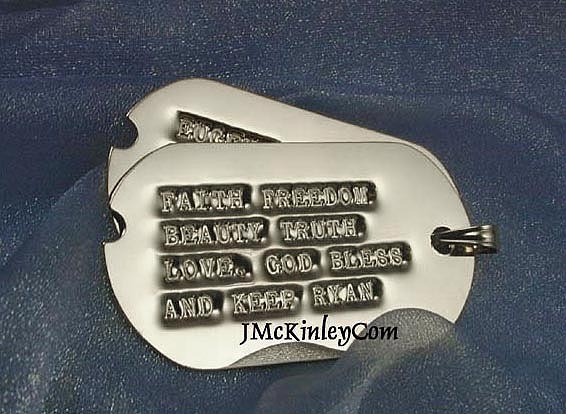 Click here for full selection of beautiful 14k gold dog tags engraved, plain, embossed, or debossed. Measures 1&1/16 inches wide by 2 inches tall, 25 gauge thickness. This stunning tag comes polished on both sides. Chains sold separately. A dog tag necklace is now a trendy fashion accessory, but it was never designed for the military with fashion purposes in mind. The metal dog tag necklace was first introduced back in 1906 for the American military. Today, there are many variations on the original dog tag necklace with major fashion houses and jewelry manufacturers putting their on spin on this military inspired design. The DT1 Dog Tag is one of the more popular sterling silver styles. Most choose to add a 3mm sterling silver dog tag bead chain.